It is possible to recover batteries that have been discharged too low but EXTREMELY DANGEROUS! With the cost of batteries as low as they are, it's not worth the risk. What will happen if you try is likely to result in a fire. It takes a very controlled very low current and very regulated power supply to successfully bring the voltage back up to a safe level. The possibility of permanent damage to the battery is also a factor. I would highly recommend that you just replace the battery and chock it up to a lesson learned. Let me come back to this and clarify a point. NEVER try to charge a Lipo that is below 3.3 volts per cell! Below tis point the majority of the current being pushed into the battery is converted to heat. Heat + Lipo = FIRE. 3 cell 1600 mah battery's are more expensive than I thought when I'm getting them from Canada... Darn. I got all my original parts from the states... But I need a new battery and shipping from the states probably isn't worth it... And to get them here its in the range of 50$ with shipping (my closest hobby shop is about a 2 hour drive...) Well I certainly won't make this mistake again. I've recovered a few batteries that ran down, mostly due to spending a night in a tree, without incident. However, as mjmccarron said, it can be a dangerous thing. LiPos are completely different than "typical" rechargeable batteries. I avoid drawing them down below 3.2 V per cell just to be on the safe side. If you choose to revive the battery, here's how to do it. Set your charger to NiMh at a very low current. Allow the battery voltage to rise to 9.0 V. DO NOT leave the battery alone. Best to do this outside. Once at 9 v, stop the charging and change your charger back to LiPo and balance charge from there. I ALWAYS balance charge at a rate below the C rating. I like to take it easy on my batteries. I suspect you will have no issues doing this, but don't ever get complacent. Uhm, the lower limit is 3.0V per cell, not 3.3V. As for the part that the majority of the current below this is converted into heat, I wasn't aware of that (and I tend to think I know quite a lot about LiPos). I concur that charging a cell that's below 3.0V should be done at very low current (<0.1C, or the lowest setting available). You are correct in stating that 3.0vpc is the lower limit specified by most manufacturers of LiPo batteries. There are even a few that set that limit as far down as 2.5vpc. However, most charger manufacturers set their equipment with a 3.3vpc limit to reduce the possibility of a problem. I was simply using the more conservative number for safety sake. You are also correct in stating that the charge must be done at a very low current. As the voltage is reduced the internal resistance of the cell rises. This rise is nor linear but suffice it to say that it increases as the voltage drops. as you may know, Power dissipated in the cell equals the square of the current times the resistance of the cell. Power = heat. This means that a slight increase in current has a large effect on the heat generated. Further, at below 1.5vpc copper shunts form within the cell forming partial or complete shorts. This is a chemical reaction and I am not a chemist but I have seen the results which range from a battery that self discharges fairly quickly to fire. I'm not disagreeing with you here but my original statement is correct. I am not a chemist or LiPo expert but I am an electrical engineer with more than 30 years of experience in power conversion. If you are determined to try this recovery, please do it outside and use the sandbag over concrete block trick to contain it should there be a fire. I had a 3s in a tree for about two weeks and it was down to .6v. Based on this thread, I decided to try to recover it. I didn't think to do IR measurement but charged it at .05A to 10v. Then I increased to .8A to finish (it was a 1300mAh). All went fine but in just 12 hours it has self discharged to about 70%. This is interesting. Let me know what you find on your 0v for IR. I may take this one back down to 0v for disposal (if it doesn't do it itself) and measure IR. Something about the rapid self discharge puts up a red flag with me. It would be interesting to compare. My iCharger 208B doesn't allow for measuring IR, it says "over", which probably means it's waaay too high. The total pack voltage is 0.06V according to my multimeter, and we're talking about a 5500 mAh 6s pack. The enormous self discharge indeed indicates it's time for a new pack. Please do an IR check *now* and after discharge, to compare. I will measure both states. I too am having trouble measuring it at near 0v so I will devise a test using small currents to calculate the resistance. It's much easier to measure during discharge with a voltage present at the battery. I'm busy on a big project at work so it may be a few days but this has my interest. I'll share my results as they are available. It's worth mentioning, the heat is actually I squared R so the increase in heat is exponential with regard to the charge current. I may retire another pack to do this. The self discharge issue of the current test subject has me worried. Its down to 3.6vpc on its own after only 24hr. I'm not in a hurry to burn down my shop. Indeed, don't do that! Also, you could measure the pack at intervals. Disclaimer: I have done this the safe way. LiPo batteries can catch fire. 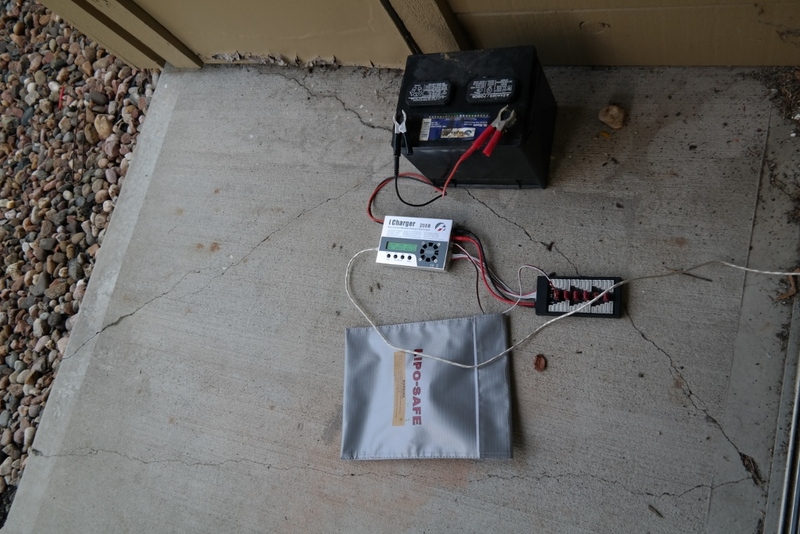 As a safety measure, I did this outside on concrete, while the pack was in a LiPo-safe bag. I do not recommend doing this. Ok, the scoop: an old 2200 mAh 3s Turnigy nano-tech LiPo battery. This one has been used mostly in a 450 helicopter, which worked fine for 20 flights, then started to lose power and puff. I still used it for another ~50 flights, after which it was no longer usable. It was then stored for about a year or so (yeah I should have just gotten rid of it). I tested the internal resistance (IR) of the battery, which was initially (at storage charge) 14-14-16--44 milli-ohms (first 3 numbers are individual cell values, the last one the total pack IR). I charged the pack, and checked, the values were 12-12-14--38. Then I discharged the pack in 0.1V increments and wrote down the IRs. Man that was a lot of work, I'm not going to post them all, suffice to say that the numbers stayed in the same ballpark throughout the discharge down to 3.0V per cell. In the last 2 measurements it wouldn't measure the cell IRs, it was giving the error "voltage too low", but I could still measure the entire pack IR. So indeed, the IR goes up as the pack gets discharged too much. So mjmccarron was right: the IR of a cell increases as the voltage of the cell is decreased below 3.0V. Here's a curve of the discharge from 4.2V to 3.0V per cell, at 0.5C (1100 mA discharge rate). The temperature of the pack is also included. Note: I discharged the pack twice: first time while stopping the discharge numerous times to do IR measurements, and a second time in one run to produce this graph. Ok so i need some help with batteries... i have a 3 cell LiPo... what Should the voltage be fully charged? and at what voltage should it be charged? and just in general any some crash courses on batterys and charging themk etc..? For LiPo packs, for each cell, do not go below 3.0v, and *try* to stay above 3.3v -- consider 3.3v as 0% resting capacity (voltage when it's had a chance to rest 15-60s after running a load) . . . but if you want long life, stay away from 3.3v. Looking at the discharge curves, mAh capacity remaining vs voltage, the rememaing capacity drops off rapidly around 3.7v. Typically it takes just about as much energy to go from 3.8v->3.7v, than it does to go from 3.7->3.3. This is due to the changing chemestry around that voltage -- the reversable reactions (read: rechargable) begin happening less frequently and the irreversable reactions (read: damaging) begin to hapen with increasing frequency. Going down to 3.3v resting will not destroy your battery, but it certianly isn't healthy for it. Available almost anywhere, with varying price, but it has two main features you want -- loud alarm and ajustable voltage. Why adjustable? becasue the target 3.7v is for *resting* voltage, but the meter measures *loaded* voltage, which can be quite different. When I fly a plane with a new power system, I'll need to calibrate that set voltage. to do so, I'll set it too high, like 3.7v, then fly until it beeps at cruising speed (not at full throttle, unless I plan on staying at WOT), land wait a minute and check the voltage. If it's still above 3.7v, I adjust it down a step and fly again until it beeps. repeat until at cruising speed it beeps and after landing and resting it measures 3.7v. If I always use the same battery on that plane, I'll scribble the setting next to where I mount the alarm. More often than not it ends up around 3.2-3.4v, but on some planes (like my lighted glider) since the draw at cruise speed is soooooo low, it's set at 3.7v. Fully charged, it should read around 4.2v/cell, and be ballanced (equal voltage) across each cell. Frankly, anything above 4.0v/cell I consider "full", but it's rare I'll have a pack less than 4.1v but more than 3.8v. Yeah I guess my post is quite a bit advanced stuff, and difficult to understand for someone who's new to the hobby. For people who are more into this and want to learn, I hope they enjoy my post . The way I do it, is I fly with a timer for 3 minutes with a new plane/helicopter, and then charge my battery again. The charger will tell me how many mAh it put back in the pack, and then I calculate my flight time for a 60% depletion of my pack, and use that in further flights. This way, my timer starts beeping when I have 40% left in the pack .